Pain Relief: Sore No More, Topricin, Arnica, EmuaidMAX, King Bio! 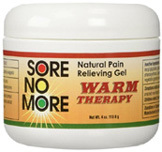 Sore No More Natural Pain Relieving Gel Warm Therapy: Sore No More Natural Pain Relieving Gel Warm therapy is the preferred for constantly sore muscles, aching joints, fibromyalgia pain, hip pain, sore feet, back pain and knee pain. Alleviates golfers elbow and warms up muscles in preparation for exercise. Exclusive heating and cooling ingredients start working fast and last for hours. Helps in reconditioning range of motion and improving circulation. Users gain for its effectiveness against arthritis pain and its light refreshing fragrance from Orange Peel extract and Witch Hazel. Non-greasy and non-staining to clothes. Free of parabens, petrolatum, alcohol, animal testing and animal products. Made in the USA. Active Ingredients: Menthol 3%, Camphor 3%. Inactive Ingredients: Aloe Vera Extract, Caprylyl Glycol, Capsaicin, Carbomer, Decyl Glucoside, Grapefruit Seed Extract, Green Tea Extract, Orange Peel Extract, Phenoxyethanol, Queen Of The Prairie Extract, Rose Water, Sodium Carbonate, Vegetable Glycerin, Water, Witch Hazel, Yucca Extract. Sore No More Natural Pain Relieving Gel Cool Therapy: Sore No More Natural Pain Relieving Gel Cool Therapy performs best for a strained muscle, new shoulder pain, an ankle sprain or wrist sprain, and new joint and muscle pain. Aids in temporarily reducing inflammation. Offers controlled cooling without freezing or irritation. Exercise cool down: Ideal for soothing stressed muscles after exercise and activity. Provides relief for recent shoulder pain, sore feet from standing or walking all day. Non-greasy and non-staining to clothes. Free of parabens, petrolatum, alcohol, animal testing and animal products. Made in the USA. Active Ingredients: Menthol, USP 6%. Inactive Ingredients: Aloe Vera Extract, Caprylyl Glycol, Carbomer, Decyl Glucoside, Grapefruit Seed Extract, Green Tea Extract, Lemon Peel Extract, Phenoxyethanol, Queen Of The Prarie Extract, Rose Water, Sodium Carbonate, Vegetable Glycerin, Water, Witch Hazel, And Yucca Extract. Topricin Pain Cream: Topricin Pain Cream is the safest substitute to all prescription and non-prescription OTC pain relieving medication. Invigorates and supports the body's desire to "Heal the Damage that is Causing the Pain". Topricin Pain Cream is made with eleven homeopathic medicines which are proven to be safe and effective for the elderly, children, pregnant women and all skin types. Feel Topricin's relief for damaged muscle, tendon, ligament and nerve tissue. No odor or fragrance, no petroleum, no mineral oil, no lanolin, no capsaicin, no menthol, no parabens. Non-greasy, non-staining. Dislocations and any other trauma injuries of the joints and muscles). -- Dislocations (of the shoulder etc.). • Topricin Pain Cream: 2 oz. Tube. ORDER NOW! 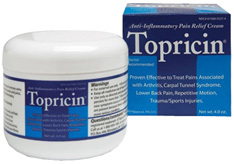 • Topricin Pain Cream: 4 oz. Jar. ORDER NOW! • Topricin Pain Cream: 8 oz. Flip top Bottle. ORDER NOW! Ingredients: Aesculus Hippocastanum 6X, Arnica Montana 6X, Belladonna 6X, Crotalus Horridus 8X, Echinacea 6X, Graphites 6X, Heloderma 8X, Lachesis Mutus 8X, Naja Tripudians 8X, Rhus Toxicodendron 6X, Ruta Graveolens 6X. Inactive Ingredients: Purified Water with solvent-free Coconut Oil, Vegetable Glycerin, Medium Chain Triglyceride. • Topricin for Children: Topricin Junior Children's Pain Relief and Healing Cream is for kids and Pediatrician recommended. Easy absorption, Junior Cream is also a multi-purpose healing cream for all the everyday bruising, scrapes, scratches, minor burns and insect bites. Ideal for muscle sprains and strains, eczema, back, heel and knee pain. Safe to use for diabetics, children 2 to 12, children under 2 years of age, consult a doctor. Fragrance free, paraben free, no petroleum, no mineral oil, no lanolin, no capsaicin, no menthol or irritating chemicals, non-greasy, moisturizing. For external use only. 1.5 oz. ORDER NOW! Ingredients: Aesculus Hippocastanum 6X, Arnica Montana 6X, Belladonna 6X, Bellis Perennis 6X, Calendula Officinalis 4X, Crotalus Horridus 8X, Echinacea 6X, Graphites 6X, Hypericum Perforatum 6X, Lachesis Mutus 8X, Naja Tripudians 8X, Rhus Toxicodendron 12X, Ruta Graveolens 6X, Sulfur 8X. Inactive Ingredients: Purified Water, Highly Refined Vegetable Oils, Glycerin, Medium Chain Triglyceridel. • EmuaidMAX First Aid Ointment: EMUAIDMAX™ offers rapid relief from difficult-to-treat, resistant skin conditions, and helps restore, relieve and healing damaged skin instantly upon application. EMUAIDMAX™ provides maximum relief from pain, infection and inflammation. Helps promote blood-flow to rapidly repair damaged, irritated skin conditions and concurrently fight bacterial and fungal infections. Helps immediately reduce pain and irritation while restoring skin health. Homeopathic EMUAIDMAX™ is the only anti-bacterial, anti-fungal and anti-inflammatory skin remedy that maintains the rapid production of new, healthy skin cells, skin repair and reduced scarring. EMUAIDMAX helps relieve for resistant skin conditions: Molluscum Contagiosum, Shingles, Severe Boils, Hemorrhoids, Eczema, Cold Sores, Fungal Infections, Warts, Poison Ivy, Psoriasis, Oak & Sumac and other itchy, painful conditions. FDA-registered homeopathic medicine. Safe for the entire family. EMUAIDMAX™ does not contain chemicals, artificial preservatives, lanolin, alcohol, parabens, petrochemicals, or fragrance. External use only. 2 oz. ORDER NOW! Active Ingredient: 10x, 20x, 30x HPUS Argentum Metallicum (Colloidal Silver). Other Ingredients: Allantoin, Bacillus Ferment, Ceramide 3, Emu Oil, Euphorbia Cerifera (Candelilla) Wax, Glyceryl Behenate, Hydrogenated Castor Oil, Lysine HCI, Melaleuca Alternifolia (Tea Tree) Leaf Oil, Olea Europaea Fruit Oil, Phytosphingosine, Silver Citrate, Squalane, Tocopheryl Acetate, Tribehenin, Vegetable Oil. • Emuaid First Aid Ointment: EMUAID® helps invigorates blood-flow to rapidly repair damaged, irritated skin conditions, simultaneously fight bacterial and fungal infections, and renewing skin health. EMUAID® is made from the highest quality natural healing ingredients available without a prescription, for wounds and a strong anti-infective used to treat skin infections. Efficient and fast-acting EMUAID® is blended with Emu Oil to provide deep moisturizing and restoring properties, and penetrate skin and tissue cells faster and more effectively better than many other systems. EMUAID® helps rejuvenate, replenish and repair the most damaged, painful, uncomfortable, and unsightly skin ailments, minor wounds and burns, bruises, ulcerations, sunburn, razor burn, scrapes, rashes, blisters, bug bites, and skin eruptions from acne, eczema or minor infection. EMUAID® is a safe and multipurpose medication for the whole family with no side effects or conflicts with other medications. EMUAID does not contain chemicals, artificial preservatives, lanolin, alcohol, parabens, petrochemicals, or fragrance. External use only. 2 oz. ORDER NOW! HEALTH RELATED/FIRST AID: EmuaidMAX First Aid Ointment, 2 oz. HEALTH RELATED/FIRST AID: Emuaid First Aid Ointment, 2 oz. • Arthritis Cream: Arthritis Cream with Capsaicin is a powerful therapy for minor aches and pains of the joints and muscles due to arthritis, backaches, strains, sprains and bruises. It works by penetrating deeply and diminishing the sensation of pain in the affected area. Made with Rice Bran Extract, Almond Oil and Shea Butter and is suitable for everyday use. It is odorless and contains no parabens, phthalates or artificial colors. For external use only. 2.4 oz. ORDER NOW! Active Ingredient: Capsaicin 0.1%. Other Ingredients: Beeswax, Butyrospermum Parkii (Shea) Butter, Cetearyl Glucoside, Cetyl Alcohol, Citric Acid, Glycerin, Glyceryl Stearate, Heptyl Undecylenate, Hydrogenated Castor Oil, Oryza Sativa (Rice) Bran Extract, Phenoxyethanol, Potassium Sorbate, Prunus Amygdalus Dulcis (Sweet Almond) Oil, Purified Water, Sodium Stearoyl Glutamate, Sodium Stearoyl Lactylate, Stearic Acid, Xanthan Gum. • Pain Relieving Ointment: Pain Relieving Ointment is a potent combination of three natural ingredients that offer calming, penetrating natural pain relief from sore muscles, joint pain, backache and minor arthritis. Made with Camphor, Menthol and Wintergreen Oil that together work as an effective analgesic without parabens or phthalates. For external use only. 2.5 oz. ORDER NOW! Active Ingredients: Camphor 4%, Menthol 10%, Methyl Salicylate (Wintergreen Oil) 15%. Other Ingredients: Beeswax, Butyrospermum Parkii (Shea) Butter, Prunus Amygdalus Dulcis (Sweet Almond) Oil, Rosmarinus Officinalis (Rosemary) Extract, Tocopherols (Vitamin E). • Muscle & Joint Rub: Muscle & Joint Rub is blended with natural Camphor to provide natural relief from the minor pains of bruises, muscle aches, strains and sprains. This exclusive formula quickly alleviates these painful conditions. Made with Vitamin E, Beeswax and Shea Butter to calm the skin. Suitable for use on minor injuries, sore muscles after sports activity, minor backaches and arthritis. For external use only. 2.5 oz. ORDER NOW! Active Ingredient: Camphor 3%. Inactive Ingredients: Arnica Montana (Arnica) Flower Extract, Beeswax, Butyrospermum Parkii (Shea) Butter, Eucalyptus Globulus (Eucalyptus) Oil, Gaultheria Procumbens L. (Wintergreen) Oil, Heterotheca Inuloides Flower Extract, Matricaria Recutita (Chamomile) Flower Extract, Melaleuca Cajeputi (Cajeput) Oil, Myroxylon Pereirae (Balsam Peru), Prunus Amygdalus Dulcis (Sweet Almond) Oil, Rosmarinus Officinalis (Rosemary) Extract, Tocopherol (Natural Vitamin E). WOMEN'S HEALTH/PAIN RELIEF: Arthritis Cream 2.4 oz. WOMEN'S HEALTH/PAIN RELIEF: Pain Relieving Ointment 2.5 oz. WOMEN'S HEALTH/PAIN RELIEF: Muscle & Joint Rub 2.5 oz. • Acute Pain Relief Cream: For temporary relief of: back and neck pain, muscle and joint pain, muscle cramps and stiffness, inflamed muscles and joints, sprains, muscle tension and soreness, body aches, tired legs and feet, stiff and swollen joints. 3 oz. ORDER TODAY! Active Ingredients: Aesculus Hippocastanum, Arnica Montana, Bellis Perennis, Bryonia, Calcarea Carbonica, Calcarea Fluorica, Cimicifuga Racemosa, Cobaltum Metallicum, Gnaphalium Polycephalum, Hypericum Perforatum, Kali Carbonicum, Kali Phosphoricum, Magnesia Phosphorica, Oxalicum Acidum, Phosphorus, Rhus Toxicodendron, Ruta Graveolens, Zincum Metallicum. Inactive Ingredients: Cetearyl Alcohol, Deionized Water, Glyceryl Stearate, Jojoba Seed Oil, Menthol, Peppermint Oil, Phenoxyethanol, Pomegranate Fruit Extract, Shea Butter, Sodium Lactate, Sodium Stearoyl Lactylate, Sweet Almost Oil, Sweet Birch Oil. • Advanced Arnica Soothing Cream: For temporary relief of symptoms from to injury or overexertion: painful swelling or stiffness in muscles or joints, sprains and strains, bruise pain and discoloration, inflammation, soreness after exercise. 3 oz. ORDER TODAY! Active Ingredients: Arnica Montana, Arnica Montana, Radix. Inactive Ingredients: Cetearyl Alcohol, Deionized Water, Glyceryl Stearate, Jojoba Seed Oil, Lemon Oil, Phenoxyethanol, Pomegranate Fruit Extract, Shea Butter, Sodium Lactate, Sodium Stearoyl Lactylate, Sweet Almond Oil. • Advanced Arnica: Nature's relief for aches and pains.This effective pain relief formula uses evergreen-based counterirritants to provide temporary relief from arthritic aches and pains, as well as muscle strains, aches and soreness caused by exertion. 2 oz. ORDER TODAY! • Arthritis Pain & Joint Relief: Temporarily alleviates symptoms due to arthritic pain: inflammation, back pain, stiff and swollen joints, leg cramps, rheumatic pain, sore tendons and ligaments, sprains and joint injuries, bone injury, contracted fingers, hip and joint pain, knee pain, aching limbs, sciatic pain, restless limbs. 2 oz. ORDER TODAY! Active Ingredients: Actaea Spicata, Aesculus Hippocastanum, Arnica Montana, Bellis Perennis, Bryonia, Calcarea Carbonica, Calcarea Fluorica, Causticum, Cimicifuga Racemosa, Formicum Acidum, Hypericum Perforatum, Ledum Palustre, Lithium Carbonicum, Magnesia Phosphorica, Phosphorus, Phytolacca Decandra, Pulsatilla, Rhododendron Chrysanthum, Rhus Toxicodendron, Ruta Graveolens, Salicylicum Acidum, Sepia, Zincum Metallicum. Inactive Ingredients: Bio-Energetically Enhanced Pure Water, Citric Acid, Potassium Sorbate. • Back, Muscle & Joint Relief: Temporarily relief of symptoms: back discomforts, muscle tension and cramps, weakness and fatigue, joint stiffness, body aches, soreness, restlessness, tired legs and feet. 2 oz. ORDER TODAY! Active Ingredients: Aesculus hippocastanum, Arnica montana, Bellis perennis, Bryonia, Calcarea carbonica, Calcarea fluorica, Cimicifuga racemosa, Cobaltum metallicum, Gnaphalium polycephalum, Hypericum perforatum, Kali carbonicum, Kali phosphoricum, Magnesia phosphorica, Oxalicum acidum, Phosphorus, Rhus toxicodendron, Ruta graveolens, Zincum metallicum. Inactive Ingredients: Bio-Energetically Enhanced Pure Water, Citric Acid, Potassium Sorbate. WOMEN'S HEALTH/PAIN RELIEF: 3 oz. WOMEN'S HEALTH/PAIN RELIEF: 2 oz. • Migraine Relief: Migraine Relief is for temporary relief of symptoms: migraine headache, sick, throbbing, or occipital headache, nausea, light sensitivity, heavy feeling in head, band feeling around head, morning headache, sun headache, pain over half the head. 2 oz. ORDER TODAY! Active Ingredients: Gelsemium Sempervirens, Glonoinum, Iris Versicolor, Kali Carbonicum, Lycopodium Clavatum, Natrum Muriaticum, Niccolum Metallicum, Nux Vomica, Sanguinaria Canadensis, Secale Cornutum, Spigelia Anthelmia, Sulphur. Inactive Ingredients: Bio-Energetically enhanced Pure Water, Citric Acid, Potassium Sorbate. 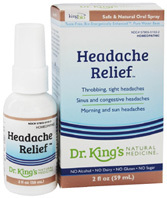 • Headache Relief: For temporary relief of headache pain: throbbing, splitting, tight, dull, sick, bursting, sinus, congestive, migraine, occipital, morning or sun headache, band feeling around the head. 2 oz. ORDER TODAY! Active Ingredients: Belladonna, Bryonia, Capsicum annuum, Chininum arsenicosum, Coffea cruda, Gelsemium sempervirens, Glonoinum, Ignatia amara, Kali bichromicum, Lycopodium clavatum, Natrum muriaticum, Nux vomica, Sanguinaria canadensis, Spigelia anthelmia, Sulphur. Inactive Ingredients: Bio-Energetically Enhanced Pure Water, Citric Acid, Potassium Sorbate. • Leg Cramp & Spasm Relief: For temporary relief of: cramps and spasms in the legs, calves, feet, or hands that occur while resting, at night, or from athletic overexertion. 2 oz. ORDER TODAY! Active Ingredients: Calcarea carbonica, Cuprum metallicum, Gnaphalium polycephalum, Hyoscyamus niger, Ignatia, Magnesia phosphorica, Nux vomica, Passiflora incarnata, Platinum metallicum, Plumbum metallicum, Secale cornutum, Strychninum. Inactive Ingredients: Bio-Energetically Enhanced Pure Water, Citric Acid, Potassium Sorbate. • Sciatic Nerve Formula: For temporary relief of symptoms associated with sciatica: shooting pain, numbness and tingling, burning sensation, leg spasms, muscle cramps, tightness and stiffness, phantom pains. 2 oz. ORDER TODAY! Active Ingredients: Aesculus hippocastanum, Ammonium muriaticum, Arsenicum album, Belladonna, Capsicum annuum, Causticum, Colocynthis, Colchicum autumnale, Gnaphalium polycephalum, Ignatia amara, Magnesia phosphorica, Rhus toxicodendron. Inactive Ingredients: Bio-Energetically Enhanced Pure Water, Citric Acid, Potassium Sorbate. • Fibro Malic Pain Relieve Cream: Fibro Malic Pain Relieve Cream is made with Capsaicin (Capsicum annuum) provides fast muscle pain relief. 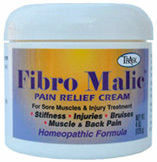 Fibro Malic Pain Relieve Cream helps reduce joint and soft tissue pain. Improves your sleep patterns and calms down nerves and body tension. Helps relieve symptoms related with arthritic pain, tendonitis, joint stiffness, sciatica, backache and Fibromyalgia. Reduces muscle cramps, spasms and pain, many aches and bothersome discomforts. Double-blind clinical studies show that it helps relieve the nerve and muscle pain caused by conditions such as osteoarthritis and fibromyalgia, whether or not there is inflammation. Non-Greasyand does not stain. For external use only. 4 oz. ORDER NOW! Ingredients: Capsicum Annuum 6x 4%, Rhus Toxicodendron 6x 4%, Arnica Montana 3x 4%, Calendula Officinalis 3x 4%, Symphytum Officinale 4x 4%, Hypericum Perforatum 3x 4%, Hydrophilic Ointment Base. HEALTH RELATED/CREAMS BALMS: Fibro Malic Pain Relieve Cream, 4 oz. • Cooling Minerals & Tea Tree Muscle Pain Therapy: Cooling Minerals & Tea Tree Muscle Pain Therapy is a cooling therapeutic balm providing instant pain relief. Made with Tea Tree Oil, this medicated formula intensely penetrates to effectively alleviate minor arthritis, backache, muscle and joint pain. Essential oils of Avocado, Evening Primrose, and Hazelnut nurture the skin. With use, skin is softened and smoothed while muscles are soothed and relaxed. For external use only. 8 oz. ORDER NOW! Active Ingredients: Methyl Salicylate: 13.5 % Inactive ingredients: Helianthus Annuus (Sunflower) Seed Oil, Carthamus Tinctorius (Safflower) Seed Oil, Beeswax Cetearyl Alcohol, Eucalyptus Globulus (Eucalyptus) Leaf Oil, Tribehenin, Menthol, Polysorbate 60, Melaleuca Alternifolia (Tea Tree) Oil, Corylus Avellana (Hazelnut) Oil, Gaultheria Procumbens (Wintergreen) Leaf Oil, Glycine Soja (Soybean) Oil, Oenothera Biennis (Evening Primrose) Oil, Olea Europaea (Olive) Fruit Oil, Persea Gratissima (Avocado) Oil, Sesamum Indicum (Sesame) Seed Oil, Tocopheryl Acetate. 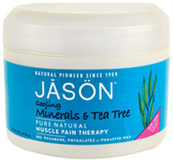 Cooling Minerals & Tea Tree Muscle Pain Therapy, 8 oz. • Wound Honey: Eras Natural Sciences Wound Honey is a wound care topical treatment which has natural, powerful anti-bacterial properties. Wound Honey is made with Active Manuka Honey which is clinically proven to have antibacterial properties to help heal and calm painful wounds, minimize infections, reduce malodor, calm pain, and protects against additional infections. Blended with Aloe Vera and Panthenol (a non-irritating form of Vitamin B) to boost the soothing properties, support in cell regeneration, minimize scarring, and speed up healing. Wound Honey has anti-inflammatory properties which reduce swelling and improve circulation to the wound site, reducing pain and decreasing exudates (ooze) from the wound. Wound Honey is to be used externally for cuts, burns, wounds, MRSA or VRE infected wounds, diabetic wounds, diabetic ulcers, bed and pressure sores, surgical wounds, and more. 80 gram/2.8 oz. ORDER TODAY! Ingredients: Manuka Honey, Natural Aloe Vera, Panthenol. WOMEN'S HEALTH/PAIN RELIEF: Wound Honey, 4 oz. • Real Relief Arnica+ Pain Relief Cream: Arnica+ Pain Relief Cream helps relieve symptoms associated with muscle aches, joint pain, strains, sprains, and bruises. Absorbs quickly into skin, fragrance free, and non-greasy. 1.76 oz. ORDER TODAY! Active Ingredients HPUS: Arnica Montana 1X (Leopard's Bane) Hypericum Perforatum 1X (St John's Wort). Inactive Ingredients: Carbomer, Ceteareth-12, Cetearyl Alcohol, Cetyl Alcohol, Cetyl Palmitate, DMDM Hydantoin, Glycerin, Glyceryl Cocoate, Glyceryl Stearate, Iodopropynyl Butylcarbamate, Isopropyl Myristate, Isopropyl Palmitate, Octyldodecanol, PEG-20 Glyceryl Stearate, PEG-100 Stearate, Purified Water, Sodium Hydroxide, Sorbitan Stearate. HEALTH RELATED/PAIN RELIEF: Real Relief Arnica+ Pain Relief Cream, 1.76 oz. • Mama Bee Leg & Foot Creme: Get a leg up on aching muscles. Give your legs and feet a treat. This rich cream is specially formulated with peppermint oil and rosemary extract to soothe and condition. Your legs and feet will thank you for the special treatment during your pregnancy. Phthalate-, petrochemical- and paraben-free. 3.4 oz. ORDER NOW! Ingredients:Water, Helianthus Annuus (Sunflower) Seed Oil, Glycerin, Cocos Nucifera (Coconut) Oil, Beeswax, Mentha Piperita (Peppermint) Oil, Stearic Acid, Hamamelis Virginiana (Witch Hazel) Water, Glucose, Sodium Bicarbonate, Triticum Vulgare (Wheat) Germ Oil, Melaleuca Alternifolia (Tea Tree) Leaf Oil, Carum Petroselinum (Parsley) Leaf Oil, Citrus Aurantium Dulcis (Orange) Peel Wax, Tocopherol, Rosmarinus Officinalis (Rosemary) Leaf Extract, Menthol, Sodium Borate, Xanthan Gum, Sucrose Stearate, Glucose Oxidase, Lactoperoxidase. • Res-Q Ointment: Nature's got your back. When nature plays a little too rough, appeal to her nurturing side to help those bumps and bruises with the gentle blend of herbal ingredients in our comforting salve. It's nice to know nature will always come to the rescue. 0.60 oz. ORDER NOW! Active Ingredient: Menthol (16.0%), Inactive Ingredients: Rhus Succedanea (Japan) Fruit Wax, Cannabis Sativa (Hemp) Seed Oil, Mentha Arvensis (Cornmint) Oil, Eucalyptus Globulus (Eucalyptus) Leaf Oil, Eugenia Caryophyllus (Clove) Stem Oil. WOMEN'S HEALTH/PAIN RELIEF: Mama Bee Leg & Foot Creme, 3.4 oz. WOMEN'S HEALTH/PAIN RELIEF: Res-Q Ointment, 0.60 oz. • Pain Relieving Liniment: Get natural pain relief with this very first product sold by J.R. Watkins in 1868. By removing all traces of artificial red coloring, we have successfully made this one of a kind pain reliever 96.5% natural! This formula puts all-natural camphor and capsicum to good use by stimulating nerve receptors that feel heat, masking the feeling of pain and relieving the discomfort of minor muscle aches, soreness and stiffness. Absorbs quickly for fast relief. 11 oz. ORDER TODAY! • White Cream Liniment:Nature's relief for aches and pains.This effective pain relief formula uses evergreen-based counterirritants to provide temporary relief from arthritic aches and pains, as well as muscle strains, aches and soreness caused by exertion. 11 oz. ORDER TODAY! 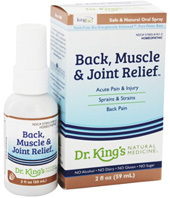 • Pain Relieving Liniment Spray: Get quick relief from sore muscles, aches and arthritis pain with this convenient, fast-acting spray.The natural pain relieving properties of our Liniment are blended with the penetrating vapors of our Menthol Camphor Relief Mist to offer you quick relief when you need it. Sore muscles, aches and arthritis pain have met their match! Perfect for hard-to-reach areas. 4 oz. ORDER TODAY! WOMEN'S HEALTH/PAIN RELIEF: 11 oz. WOMEN'S HEALTH/PAIN RELIEF: Pain Relieving Liniment Spray, 4 oz. • Intensive Pain Relief: Combining Thunder Ridge Emu Oil, Aloe Vera and MSM (one of nature's richest sources of sulfur) gives long lasting relief to both the chronic pain of joint and muscle inflammation but also the quick relief needed for muscle pulls, sprains, sports injuries and over exertion. This unique gel opens the skin's pores allowing penetration straight to the problem yet offers a cool relaxing feeling on the skin. Intensive Pain Relief leaves no residue on the skin, does not stain clothing or leave any lingering "medicine cabinet" smells. External use only. 2 oz. / 4 oz. / 8 oz. ORDER TODAY! WOMEN'S HEALTH/PAIN RELIEF: Intensive Pain Relief, 2 oz. WOMEN'S HEALTH/PAIN RELIEF: Intensive Pain Relief, 4 oz. WOMEN'S HEALTH/PAIN RELIEF: Intensive Pain Relief, 8 oz. Arnicaflora Arnica Gel:(Releives Pain, Swelling, Stiffness & Brusiing) Its active ingredient, Arnica montana, has been successfully used in countries around the world for centuries for relief of the pain, bruising, swelling and stiffness of injured muscles and soft-tissue injuries and pain. Absorbs quickly into the skin, carrying natural relief to injured tissue. Contains 8% Arnica montana tincture for maximum relief. Recommended by doctors and pharmacists, and can be used with confidence. Contains no harsh chemicals, no aspirin or acetaminophen, and no non-steroidal anti-inflammatory drugs. Topical gel. • Arnicaflora Arnica Gel: 1 oz. ORDER TODAY! 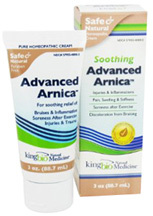 • Arnicaflora Arnica Gel: 2.75 oz. ORDER TODAY! WOMEN'S HEALTH/PAIN RELIEF: ARNICAFLORA, 1 oz. WOMEN'S HEALTH/PAIN RELIEF: ARNICAFLORA, 2.75 oz. • Triflora Arthirits Gel:(Relieves Arthritis & Joint Pain, Tendinitis, Aches, Pain, Backache & Stiffness) Contains three natural active ingredients prescribed by doctors for years to relieve swollen, painful joints. Safely can be used with other medications to improve mobility of painful, stiff joints naturally. Will not burn or chill the pain, and is fast-acting and readily absorbed. Can be used with confidence and is known for its safety and efficacy by doctors and pharmacists. Non-greasy, light herbal scent. Topical gel. 1 oz. & 2.75 oz. ORDER TODAY! INGREDIENTS: Symphytum (comfrey) 1X 10%; Rhus toxicodendron (Poison Ivy) 3X 5%; Ledum (Wild Rosemary) 1X 2.5%. • Sports Gel for Trauma: (For Deep Muscle, Back & Joint Pain, and Inflammation from Sports Injuries) A fast-acting, professional strength topical medicine formulated for sports injuries and over-exercising. Provides maximum strength relief muscle, joint, and tendon pain and inflammation. Contains four active ingredients that address minor pain from soft tissue injury, bone bruising and nerve injuries. In addition to inceasing mobility, flexibility and range of motion. Topical gel. 2.5 oz. ORDER TODAY! INGREDIENTS: Bellis perennis (Daisy) 1X, Hypericum perforatum (St. John's Wort) 2X, Rhus toxicodendron (Poison Ivy) 3X, Ruta graveolens (Rue) 1X. WOMEN'S HEALTH/PAIN RELIEF: Triflora Arthritis Gel, 1 oz. WOMEN'S HEALTH/PAIN RELIEF: Triflora Arthritis Gel , 2.75 oz. WOMEN'S HEALTH/PAIN RELIEF: Sports Gel for Trauma, 2.5 oz. • H+ Care Hemorrhoid Cream: H+ Care Hemorrhoid Cream helps provide calming relief from local itching, burning, and irritation related with hemorrhoids. Made with 4 specially selected plant tincture active ingredients, each working together to help comfort, calm and alleviate the affected area. H+ Care Hemorrhoid Cream is a topical herbal remedy, traditionally used in the symptomatic treatment of hemorrhoids. External use only. 50 gm. ORDER TODAY! Active Ingredients: Aeculus Hippocastanum 1X HPUS Alleviates Irritation And Itching Calendula Officinalis 1X HPUS Promotes Healing Collinsonia Canadensis 1X HPUS Alleviates Itching Hamamelis Virginiana 1X HPUS Alleviates Pain Paeonia Officinalis 1X HPUS Alleviates Itching And Pain Inactive Ingredients Aloe Vera, Beeswax, Caprylic/Capric Triglyceride, Caprylyl Glycol, Cetearyl Alcohol, Cetyl Palmitate, Citric Acid, Glycerin, Glyceryl Stearate Citrate, Hydrogenated Vegetable Oil, Isopropyl Palmitate, Potassium Sorbate, Purified Water, Shea Butter, Xanthan Gum. WOMEN'S HEALTH/PAIN RELIEF: H+ Care Hemorrhoid Cream, 1 oz. Travel Rescue Kit. 4 pc. WOMEN'S HEALTH/PAIN RELIEF: Muscle Rescue Gel, 3.5 oz. WOMEN'S HEALTH/PAIN RELIEF: Travel Rescue, 4 pc. • Arnica Ointment: Hyland's Arnica Ointment is a topical preparation for the treatment of muscle aches and pains due to overexertion and minor bruises from falls and strains. The ointment is perfect for rubbing into sore muscles after overexertion. Arnica Montana is well known for easing the symptoms of bruising and muscle soreness. Arnica Ointment is great for muscle soreness, rheumatic pains and stiffness, sprains, bites, stings, sore cuticles and chapping, but shouldn't be used on broken skin. External use only. 1 oz. Tube. ORDER NOW! Ingredients: An extract of Arnica Montana flowers in a base of Petrolatum with 5% beeswax. 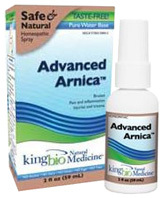 Arnica Spray: Arnica Montana is known for its healing power of bruising and muscle soreness. Often, as in cases of sprained ankles, the area is quite tender and the thought of touching it can send you through the roof. If you prefer not to rub in Arnicated Oil or Arnica Ointment, you can get the benefits of Arnica Montana by using Arnica Spray. Arnica Spray is an extract of Arnica Montana in isopropyl alcohol. Do not use this product on broken skin. External use only. ORDER NOW! Ingredients: 10% extract of Arnica Montana flowers in a base of 50% Isopropyl Alcohol USO, Purified Water USP. Arnica Ointment, 1 oz. | Arnica Spray, 1 oz. WOMEN'S HEALTH/PAIN RELIEF: Arnica Spray, 4 oz. • Muscle Pain Management: Muscle Pain Management treatment is the only safe, non-habit forming, 100% certified organic, topical relief that heals at the root of the pain to prevent it from returning. Delivers powerful, lasting relief for sore muscles and joint pain. Heals and repairs the damaged tissues. All-natural pain reliever helps fight joint and muscle pain at its source with Muscle Pain Management. For Topical Use Only. 11 ml. ORDER TODAY! Active Ingredients Thuja Occidentalis 6X, Arnica Montana 30C, Aesculus Hippocastanum 6C, Hypericum Perfoliatum 12C, Ruta Graveolens 30C. Also Contains: Sesame Oil, Lavandin Oil, German Chamomile Oil, Niaouli Oil, Rosemary Oil. WOMEN'S HEALTH/PAIN RELIEF: Muscle Pain Management, 11 ml. • Back Pain + Sciatica: It's difficult to stay energetic when you suffer from lower back or leg pain, muscle cramps, stiffness or muscle spasms. With the fast acting homeopathic Back Pain + Sciatica oral spray helps get fast relief without side effects from back pain and sciatica quickly. Helps alleviate symptoms related with back pain/sciatica, such as: lower back pain, muscle cramps, neck and back stiffness, and muscle spasms. For topical use only. 2 oz. ORDER TODAY! Ingredients: Extra virgin olive and sweet almond oils, super-infused with Arnica, Calendula Betula, St. John's Wort blossoms, Ho shou wu, pure essential oils including Lavender, Rosemary, Roman Chamomile, and Vitamin E.
WOMEN'S HEALTH/PAIN RELIEF: Back Pain + Sciatica, 1 oz. • Celadrin Joint Cream: Celadrin is scientifically formulated to provide quick-absorbing concentrated support to affected areas. This non-greasy, soothing joint cream contains the clinically-proven natural proprietary blend of esterified fatty acids. Natural pleasant scent. Celadrin contains no mineral oil, petroleum, animal products and has not been tested on animals. Free of parabens, artificial fragrances and colors. FOR EXTERNAL USE ONLY. DO NOT INGEST. KEEP OUT OF REACH OF CHILDREN. STORE IN A DRY PLACE AND AVOID EXCESSIVE HEAT. WARNING: Avoid this product if you are allergic or sensitive to any of the ingredients in this product. Do not apply to broken or irritated skin or areas affected by rashes. Discontinue use and consult your doctor if skin sensitivity occurs. Avoid contact with eyes. Do not use on children or animals. 4 oz. ORDER TODAY! Ingredients: Water, Celadrin (7.5%) (Esterified Fatty Acid Complex (EFAC), Olive Oil), Caprylic/Capric Triglycerides, Glycerin, Isopropyl Myristate, Helianthus Annuus (Sunflower) Seed Oil, Emulsifying Wax NF, Mentha Piperita (Peppermint) Oil, Dehydroacetic Acid (and) Benzyl Alcohol, Dimethicone, Cetyl Alcohol, Polysorbate 80, Tocopherol, Triethanolamine, Acrylates/C10-30 Alkyl Acrylate Crosspolymer, Sodium Magnesium Silicate, Citric Acid. WOMEN'S HEALTH/PAIN RELIEF: Celadrin Joint Cream, 4 oz. • Po Sum On Medicated Oil: Chinese herbal Po Sum On Medicated Oil to temporarily relieve minor aches and pains of muscles and joints due to simple backache, arthritis, strains, bruises and sprains. Adults and children 2 years of age and older. For external use only. 1 oz. ORDER NOW! Active Ingredients Menthol 15%. Inactive Ingredients Baikal Skullcap Root, Chinese Licorice Root, Cinnamon Oil, Dragon's Blood Resin, Peppermint Oil, and Tea Oil. 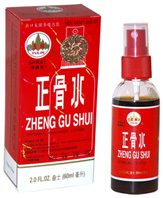 • Zheng Gu Shui Sports Pain Relief Liquid: Zheng Gu Shui Sports Pain Relief Liquid temporarily relieves minor aches and pains of muscles and joints due to simple backache, arthritis, strains, bruises and sprains. Adults and children 2 years of age and older: apply to affected area not more than 3 to 4 times daily. For external use only. 3.4 oz. ORDER NOW! 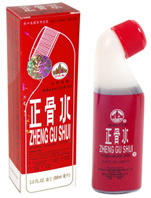 • Zheng Gu Shui Sports Pain Relief Liquid w/ Applicator Brush:Zheng Gu Shui Sports Pain Relief Liquid temporarily relieves minor aches and pains of muscles and joints due to simple backache, arthritis, strains, bruises and sprains. Adults and children 2 years of age and older: apply to affected area not more than 3 to 4 times daily. For external use only. 3 oz. ORDER NOW! Active Ingredients: Champhor 5.6%, Menthol 5.6%. Inactive Ingredients: Alcohol, Japanese Knotweed (Polygoninum Cuspidatum Siebold & Zucc). Rhizome, Particulate Shallowwort [Pycnostelma Paniculatum (Bge.) K. Schum.] Root, Shin Leaf Prickly Ash (Zanthoxylum Nitidum (Roxb. )DC] Root, Water, and Zedoart Rhizome. • Zheng Gu Shui Sports Pain Relief Liquid Spray:Zheng Gu Shui Sports Pain Relief Liquid temporarily relieves minor aches and pains of muscles and joints due to simple backache, arthritis, strains, bruises and sprains. Adults and children 2 years of age and older: apply to affected area not more than 3 to 4 times daily. For external use only. 2 oz. ORDER NOW! Active Ingredients: Camphor 5.6, Menthol 5.6%. Inactive Ingredients: Alcohol, Japanese Knotweed (Polygonum Cuspidatum Siebold & Zucc.) Rhizome, Paniculate Swallowwort [Pycnostelma Paniculatum (Bge.) K. Schum.] Root, Shin-Leaf Prickly Ash [Zanthoxylum Nitidum (Roxb.) DC.] Root, Water, and Zedoary Rhizome. • White Flower Analgesic Balm: White Flower Analgesic Balm is blended with essential oils from Lavender, Eucalyptus and Peppermint, as natural herbal pain reliever. Just a few drops of oil transforms warm water into a soothing foot soak to relieve tired feet. The floral fragrance acts as aromatherapy to release stress, clear sinuses, and relax the entire body. White Flower Analgesic Balm is used as a fragrance, quickly relieve headaches, or as a rub to relax muscle tension at any time. For the temporary relief of minor aches and pains of muscles and joints due to: simple backache, arthritis, strains, bruises, sprains. For external use only. 0.67 oz. ORDER NOW! Active Ingredients Camphor 6%, Menthol 15%, Methyl Salicylate 40%. Inactive Ingredients: Eucalyptus Oil, Lavender Oil and Peppermint. • Ching Wan Hung Soothing Herbal Balm for Burns: This natural, soothing Ching Wan Hung Soothing Herbal Balm for Burns provides temporary relief from pain and itchiness related with minor burns. Perfect for sunburn aftercare. For the temporary relief of pains and itching associated with minor burns, sunburn. For external use only. 1.06 oz. ORDER NOW! Active Ingredients: Menthol 1%. Inactive Ingredients: Dong-Quai [Angelica Sinensis (Oliv.) Diels] Root, Mastic (Pistacia Lentiscus L.) Resin, Myrrh Leo-Gum Resin, Quince (Chaenomeles Spp.) Fruit, Safflower Flower, Sanguisorba (Sanguisorba Officinalis L.) Root, Sesame Oil, and Yellow Wax. WOMEN'S HEALTH/PAIN RELIEF: Po Sum On Medicated Oil, 1 oz. Zheng Gu Shui Sports Pain Relief Liquid Spray, 2 oz. Ching Wan Hung Soothing Herbal Balm for Burns, 1.06 oz. Liquid 3.4 oz. | Liquid w/ Applicator Brush 3 oz. 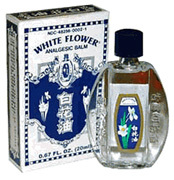 WOMEN'S HEALTH/PAIN RELIEF: White Flower Analgesic Balm. 0.67 oz. Tiger Balm: is one of the world's leading topical analgesics, with a soothing action that relieves muscular aches and pains. Tiger Balm's unique formulation contains camphor, menthol, cajuput oil and clove oil. ORDER TODAY! • Tiger Liniment: The liquid version of Tiger Balm® that is great for massages and pre-warm-up rub downs. Tiger Liniment provides temporary relief for aches and pains of muscles and joints due to simple backaches, arthritis, strains, bruises and sprains. Provides penetrating pain relief. 2 oz. ORDER NOW! • Red Extra Strength: For stronger action with comforting aroma of cinnamon oil. Feel the warmth of its ingredients helping to relieve muscle soreness and stiffness. Concentrated Vanishing Scent. 0.63 oz. ORDER NOW! Red Extra Strength Ointment, 0.63 oz. WOMEN'S HEALTH/PAIN RELIEF: Tiger Liniment, 2 oz. WOMEN'S HEALTH/PAIN RELIEF: Tiger Ointment, Red EXTRA Strength, 0.63 oz. Ultra Sports Rub: Ultra STRENGTH TIGER BALM Pain Relieving Ointment works where it hurts. Ultra-Strength TIGER BALM contains more of what makes TIGER BALM work where it hurts. With more pain-relieving menthol than Extra Strength TIGER BALM, NEW non-staining Ultra Strength TIGER BALM provides deep penetrating ultra relief to work where it hurts. WARNING: For external use only. Avoid contact with eyes. If condition worsens or persists for more than seven days, discontinue use and consult a physician. May cause an allergic reaction in some individuals with sensitive skin, test on small area before use. If severe irritation occurs, discontinue use immediately and consult a physician. Do not apply to wounds or damaged skin. Do not bandage tightly. As with any drug, if you are pregnant or nursing a baby, seek the advice of a health professional before using this product. drugs out of the reach of children. In case of accidental ingestion, contact a Poison Control Center of physician immediately. WOMEN'S HEALTH/PAIN RELIEF: Ultra Sports Rub, 0.63 oz. WOMEN'S HEALTH/PAIN RELIEF: Ultra Sports Rub, 1.7 oz. • Arthritis Rub Cream: Provides fast temporary soothing relief associated with sore, aching muscles, muscle strain, backaches and stiffness. 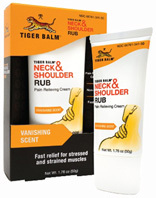 Tiger® Muscle Rub's deep penetrating formula starts to soothe sore muscles immediately. Massage in Tiger® Muscle Rub before sports exercise to help prevent stiffness from setting in. Use it after sports and exercise to help soothe aching muscles, muscle strain and stiffness. 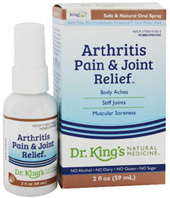 Effective arthritis pain relieving cream. Easy to use pump. Alcohol-Free. 4 oz. ORDER TODAY! Active Ingredients: Camphor 11%, Menthol 11%. Inactive Ingredients: Cajuput Oil, Chondroitin Sulfate, Cinnamon Oil, Clove Oil, Deionized Water, Dementholized Mint Oil, Diazolidinyl Urea, Glucosamine Sulfate, Methyl Paraben, Methylsulfonylmethane (MSM), PEG-120 Methyl Glucose Dioleate, Propyl Paraben,Propylene Glycol. • Neck & Shoulder Rub: Tiger Balm Neck & Shoulder Rub provides fast, soothing relief for neck and shoulder pain and the aches caused by work stress, tension, and sitting at a desk for long periods of time. The easy-to-carry and no-fuss dispensing tube makes it convenient to dispense anytime or anywhere you need a lift - in the office or on the go. The creamy, water-based blend of camphor and menthol gives Tiger Balm Neck & Shoulder Rub a clean, non-greasy feel while the vanishing scent makes it practical for any social or office situation. Caution: If pregnant or breastfeeding, or if you have sensitive skin, ask a healthcare professional before use. Keep out of reach of children. This product may cause allergic reaction in some individuals. Test on small area before use. For external use only. 1.76 oz. ORDER TODAY! Active Ingredients: Camphor (11%), Menthol (10%). Inactive Ingredients: Dementholized Mint Oil, Diazolidinyl Urea, Eucalyptus Oil, FD&C Blue 1, Glycerin, Lavender Fragrance, Methyl Glucose Dioleate, Methylparaben, PVM/MA Decadiene Crosspolymer, Propylene Glycol, Propylparaben, Triethanolamine (TEA), Water. WOMEN'S HEALTH/PAIN RELIEF: Arthritis Rub Cream, 4 oz. WOMEN'S HEALTH/PAIN RELIEF: Neck & Shoulder Rub, 1.76 oz. • Therapy Oil Concentrate: For chronic pain and stiffness. Use regularly upon rising, before retiring and as needed to support joints and soft tissue. This non-staining, non-greasy, highly concentrated formula has a soothing herbal aroma and is designed for instant action without that menthol-medicine smell. THERAPY OIL massage, bath, or steam towel. Keep bottle closed and out of the sun to maintain potency. For topical use only. 2 oz. ORDER TODAY! WOMEN'S HEALTH/PAIN RELIEF: Therapy Oil Concentrate, 2 oz. • Calendula (Marigold) Ointment: Calendula (Marigold) Ointment delivers a fast relief to pain in wounds, vanish varicose veins, brings swift relief in phlebitis varicose ulcers, fistulas, frost bites and burns. Calendula Ointment is suitable for Athlete's foot, rough dry skin, and baby care. 3.5 oz. ORDER TODAY! WOMEN'S HEALTH/PAIN RELIEF: Calendula (Marigold) Ointment, 3.5 oz. • The Wave Sports Comfort Gel: The Wave Sports Comfort Gel provides a cool, calming, natural comfort. Helps relieve minor muscles aches, strains and pains. Wave Sports Comfort Gel formula is pulsating and multi-tasking with botanticals Tea Tree, Boswellia, Red Tea, Nettle, Ginger, White Willow Bark and Essential Oils. CAUTION: Consult a physician for children under 12 years of age, or if discomfort continues. For external use only. 5 oz. ORDER TODAY! Ingredients: Purified Water (Aqua), Organic Aloe Barbadensis (Aloe) Leaf Gel, Prunus Dulcis (Sweet Almond) Oil, Aspalathus Linearis (Rooibos) Leaf Extract, Organic Simmondsia Chinensis (Jojoba) Seed Oil, Organic Olea Europaea (Olive) Fruit Oil, Caprylic / Capric Triglyceride, Cetearyl Olivate, Glycerin USP (Kosher), Salix Alba (White Willow) Bark Extract, Organic Urtica Dioica (Nettle) Leaf Extract, Sorbitan Olivate, Organic Zingiber Officinale (Ginger) Root Extract, Capsicum Annuum (Cayenne Pepper) Extract, Organic Lobelia Inflata (Lobelia) Herb Extract, Arnica Cordifolia (Arnica) Flower Extract, Boswellia Serrata Extract, Curcuma Longa (Turmeric) Root Extract, Niacinamide (Vitamin B3), Avena Sativa (Oat) Avenanthramides Extract, Tocobiol (Vitamin E), Organic Hippophae Rhamnoides (Seabuckthorn) Oil, Salvia Hispanica (Chia) Seed Oil, Organic Rosa Rubiginosa (Rosehip) Seed Oil, Organic Punica Granatum (Pomegranate) Seed Oil, Vaccinium Macrocarpon (Cranberry) Seed Oil, Plukenetia Volubilis (Sacha Inchi) Seed Oil, Melaleuca Alternifolia (Tea Tree) Oil, Eucalyptus Globulus Leaf Oil, Mentha Spicata (Spearmint) Oil, Mentha Piperita (Peppermint) Oil, Mentha (Menthol USP), Caprylhydroxamic Acid, Caprylyl Glycol, Xylitol & Potassium Sorbate. WOMEN'S HEALTH/PAIN RELIEF: The Wave Sports Comfort Gel, 5 oz. • Weekend Warrior Balm w/MSM: Weekend Warrior Balm is a liquid muscle balm soaks right into the affected area. MSM promotes free movement in muscles and joints. Calms sore muscles and arthritic joints. Helps prevent stiffness of neck, back or shoulder, and muscles from exercise or overexertion. Helps relieve tendinitis and osteoarthritis stiffness or pain, leg or muscle cramps or spasms, menstrual cramps, fibromyalgia, and hemorrhoids. Use before exercise to limber-up more quickly. Use as often as needed with no ill effects. Lasts for several months of daily use (a little goes a long way). It has an Aloe base with a pleasant fragrance. 2 oz. ORDER TODAY! Ingredients: Certified Organic Aloe Barbadensis; Methylsulfonylmethane (MSM); Certified Organic Simmondsia Chinensis (Jojoba) Seed Oil; Sodium Carboxymethyl Betaglucan (from the cell walls of yeast); Ayterion Agua (Ionized Spring Water), Phenoxyethanol (and) Ethylhexylglycerin (Preservative System), Hydrogenated Vegetable Lecithin, Xanthan Gum, Certified Organic Essential Oil Blend (Marjoram, Basil, Cypress And Lavender). WOMEN'S HEALTH/PAIN RELIEF: Weekend Warrior Balm w/MSM, 2 oz. • Muscle Ease Body Oil: Aromatic Muscle Ease Body Oil helps ease overworked muscles and warm your skin. A calming body oil to revitalize muscles and joints after workouts, sports or general over-exertion. Muscle Ease Body Oil can also be used before an activity, or simply to melt away everyday tension and fatigue. Made with a skin pampering base of Jojoba and Moringa, it's rich in nurturing vitamins, antioxidants and Omega 6 & 9 fatty acids. Fragranced with spicy Ginger, refreshing Lemongrass and toning Rosemary. Free from synthetic fragrances and parabens. 3.3 oz. ORDER TODAY! Ingredients: Sesamum Indicum (Sesame) Seed Oil, Moringa Oleifera Oil, Simmondsia Chinensis (Jojoba) Seed Oil, Lavandula Angustifolia (Lavender) Oil, Rosmarinus Officinalis (Rosemary) Leaf Oil, Litsea Cubeba (May Chang) Fruit Oil, Salvia Sclarea (Clary Sage) Oil, Cymbopogon Citratus (Lemongrass) Leaf Oil, Citrus Aurantium Bergamia (Bergamot) Peel Oil, Mentha Piperita (Peppermint) Oil, Origanium Majorana (Marjoram) Leaf Oil, Tocopherol, Zingiber Officinale (Ginger) Root Oil. WOMEN'S HEALTH/PAIN RELIEF: Muscle Ease Body Oil, 3.3 oz. • Analgesic Salve: Olba's Analgesic Salve helps calm common backaches, whether due to muscle strain, excess activity or inactivity. Also effective for relief from minor inflammation and discomforts from arthritis, sore muscles, joint pain, strains, bruises and sprains. The soothing vapor action of Olba's Analgesic Salve makes it a amazing therapy for children's coughs and colds. Simply apply generously to chest area. The natural vapor action helps them breathe better and relieves coughing for sound sleep! Analgesic Salve offers a soothing cooling effect on sunburn pain. The greaseless formula quickly absorbs into the skin, providing warm, long-lasting, fast pain relief. For topical use only. Made in Switzerland. 1 oz. ORDER TODAY! Active Ingredients: Menthol Other: Hydrogenated Peanut Oil, Glyceryl Stearate SE, White Soft Paraffin, Peppermint Oil, Eucalyptus Oil, Cetearyl Alcohol (and) Sodium Cetearyl Sulfate, Propylene Glycol, Cetyl Alcohol, Cajeput Oil, Wintergreen Oil, Juniper Oil, Clove Oil. WOMEN'S HEALTH/PAIN RELIEF: Analgesic Salve, 1 oz.